Brief Synopsis – A sport writers goes undercover as a football quarterback in order to experience what it is like going through training camp. My Take on it – This is a film that I hadn’t heard of until I recently saw that it was reviewed by Dubsism on his site which got me intrigued to see what it was all about. I have always been a fan of Alan Alda and this film gives him a rare opportunity to play BOTH a sportswriter and an athlete in an attempt to break through the various myths about what goes on behind the scenes during training. The film has a great premise that is helped a lot by the fact that it is based on true events. They wisely use real football players playing themselves in order to add even more realism to the story. 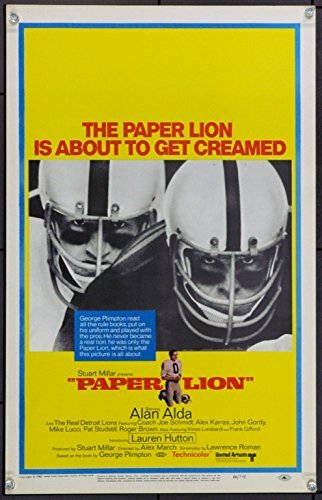 Alda is superb in the lead role here and comes across as being believable as both a quarterback and as a journalist. The general premise used here about a reporter going undercover to discover truth is an idea that has been done quite often in Hollywood, but this film manages to give it a different spin which works quite well; perhaps because it is based on facts. They do a great job here showing the way that athletes and sportswriters treat one another and clash on many viewpoints on the way things are in the world of the athlete. At the same time, they manage to dispel some myths about this topsy-turvy relationship by showing how things are instead of how they are usually perceived. Bottom Line – Really interesting premise that is helped by the fact that it is based on truth. The use of real football players also helps make this story feel even more realistic. Alda is superb in the lead role and is believable as both a football quarterback and as a journalist trying to get his scoop. This film’s general premise has been redone numerous times over the years, but this still stands out as being among the best made largely due to the fact that it is based on fact. This film does a nice job showing the way that athletes and journalists may clash on the way that they see things, but it also tries to show the way to break through myths once you can see how things are as opposed to just perceived. Recommended!